Cove Rangers defender Harry Milne wants his side to finish the job against Auchinleck on Saturday. 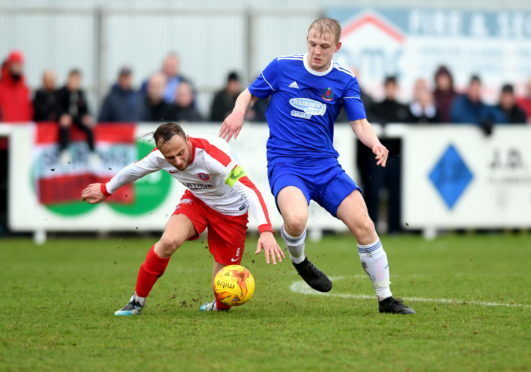 The Highland League champions spurned the opportunity to put the junior side out on home soil last Saturday and must do it all again in East Ayrshire in three days’ time. He said: “We had chances to finish them off in the first game at our place last weekend – Jordon Brown saw one hit the post and Jamie Masson also missed a good chance, just after they had equalised from the spot. “We seemed to stop playing in the second half and let them back into the game. “They had the lion’s share of the second half but thankfully our keeper, John McCafferty, was in top form. I suppose, after the way the second half had gone, we were happy to take the draw, re-group and go again down there this weekend. “No doubt we will be in for a pretty hostile reception at their place, but we will have quite a few lads back who missed the first game. “Goalkeeper Stuart McKenzie and Daniel Park were both attending weddings, Jordan MacRae was on holiday and of course I was suspended. Cove defender Milne is eager to be involved at Auchinleck after sitting out the first game at Balmoral Stadium through suspension. The 21-year-old said: “I thought that I was available to play in the first leg. I didn’t expect the booking I picked up in a very competitive game against Falkirk in last season’s Scottish Cup to carry over to this year’s competition, but it did, so it was really frustrating to have to watch the first game from the touch-line. The prize for the winners is an away trip to Fraserburgh in the third round on the weekend of November 24. Kick-off has been brought forward to 2.30pm to allow the game to be played to a conclusion, as Auchinleck do not have floodlights. John Sheran’s men enjoyed a run to the fifth round of the competition last year, eventually losing 3-1 to Championship side Falkirk.